Natalie, Lauren and Ashley's Blog: Natalie's new "chair"
Tracy bought a "C" pillow to help support Natalie's weight (and save her wrists) while breastfeeding. And now, we've found another great use for it... Natalie's post-feed chair. We sit her up for a few minutes after each feeding to play with her (she seems really comfy... imagine a giant adult-sized version?) and also to make sure the food goes down and stays down. 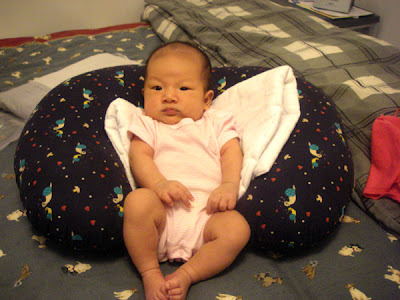 Here's pic of Natalie chilling in her chair.